Researchers in the U.S. and U.K. have uncovered a link between an antimicrobial toxin that is produced by common gut bacteria to fend off their rivals and inflammatory bowel disease (IBD). 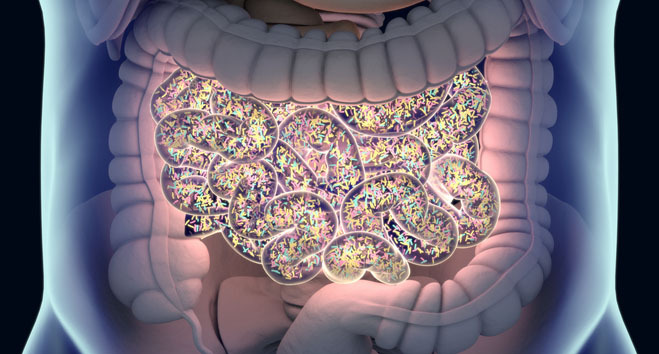 The studies more broadly discovered that, in addition to the well-studied microbial toxin microcin B17, structurally related compounds that are found in many foods and environmental sources can also directly trigger gastrointestinal inflammation by modifying the activity of CD1d, a major histocompatibility complex (MHC) molecule. CD1d is found on intestinal epithelial cells (IECs) and hematopoietic cells, and functions to present lipid antigens to natural killer T cells (NKT). The research teams, led by Richard S. Blumberg, M.D., and Shankar S. Iyer, Ph.D., at the Brigham and Women’s Hospital, Harvard Medical School, and by Tony Maxwell, Ph.D., at the John Innes Centre in the U.K., hope that their findings could led to the development of new treatments. “These findings will advance our understanding of how gut inflammation associated with IBD may be triggered and offer new hope of potential future therapy,” comments Fred Collin, Ph.D., a researcher in the Maxwell lab. IBD is a complex disease that involves the interplay between genes and “poorly understood environmental factors,” which in combination define susceptibility to and severity of disease, the authors write. It was already known that a compound called oxazolone could trigger colitis in animal models, and work had confirmed that oxazolone-induced colitis was dependent upon CD1d and NKT cells. Further studies in animals had suggested that commensal bacteria could also impact directly on NKT responses and CD1d. The U.S. team reasoned that oxazolone may represent an example of a much larger group of environmental chemicals that could trigger CD1d-restricted NKT cell responses. Their studies identified a number of environmental mimetics of oxazolone derived from dietary, industrial, and microbial sources, which similarly drive CD1d-dependent inflammation by activating the aryl hydrocarbon receptor (AhR) pathway in IECs in the colon. The compounds are all characterized by the presence of a five-membered oxazole ring. Their screening studies reported in Cell indicated that compounds containing the oxazole ring component also triggered similar CD1d-restricted responses in IECs. Compounds identified included dietary components found in coffee, peanuts, and meat, and in vivo studies showed that challenge with dietary-sourced oxazole was enough to trigger weight loss and inflammatory gut responses in experimental mice. Screening studies also identified a class of bacterial-derived antimicrobial toxins, known as thiazole-/oxazole-modified microcins (TOMMs), which contained the oxazole ring. Tests with one of these, microcin B17, which was originally isolated from intestinal Escherichia coli, similarly triggered severe gut inflammatory responses. “These studies thus identify an oxazole-containing microbial mimic that promotes CD1d-dependent intestinal inflammation independent of its classical antimicrobial activity,” the authors state. The researchers say their experimental results support a model in which exposure to the oxazole or thiazole ring-containing compounds causes transcriptional changes in the intestinal epitheliun, which influences CD1d-restricted antigen presentation pathways and exacerbates NKT cell inflammatory responses, ultimately leading to colitis. Further transcriptional studies indicated that oxazolone, the E. coli toxin, and a number of the oxazole compounds, including dietary and synthetic oxazoles, activated epithelial AhR pathways, which modulated epithelial-derived CD1d-restricted responses. Interestingly, the authors had previously demonstrated an important physiological role for CD1d during colonization of the gut by commensal and pathogenic bacteria. “Consequently, generation of products that modulate CD1d activity, such as oxazoles, which are capable of specifically inhibiting IEC function, may affect the ability of microbes to colonize the intestine and potentially cause inflammation,” they write.